The VeSyMA – Engines library provides the necessary components for creating semi-empirical and predictive engine models. These models can then be used in standalone experiments (e.g. engine-on-dynamometer) or within vehicle model architectures. The library allows both MVEMs (Mean Value Engine Models) and CAREMs (Crank Angle Resolved Engine Models) to be built from template-based subsystems and components. The open nature of the Modelica language and modelling philosophy enables the user to easily extend predefined models and allow content customization when required. 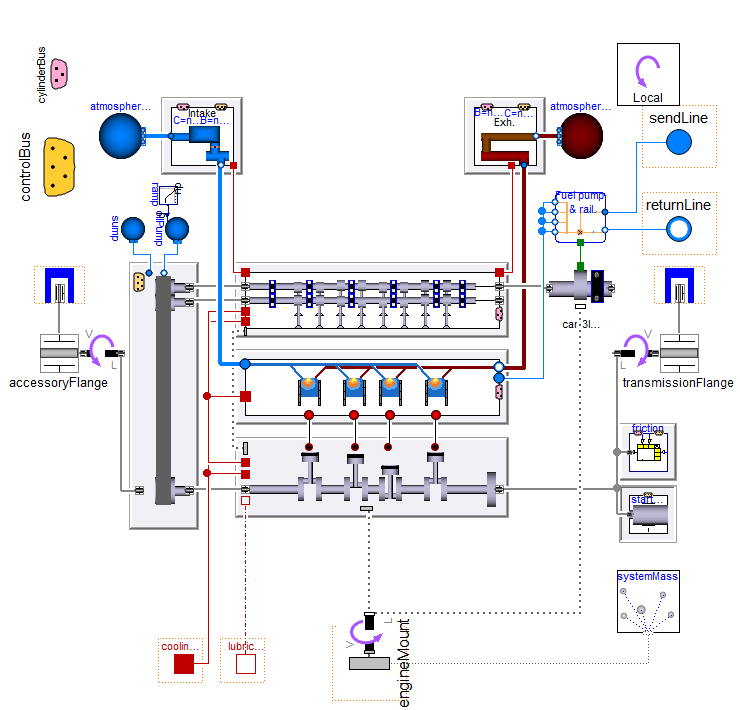 Use of Modelica Standard Library connectors maximizes the extendibility and integration with other libraries. Figure 1: Diagram layer of an I4 CAREM with high pressure fuel pump and hydraulically actuated variable cam timing. The airpaths of the engine intake, combustion chamber and exhaust are modelled using 0-d and 1-d components from the Claytex fluids library. The Claytex.Fluid library builds on the Modelica.Fluid library by enhancing functionality and efficiency yielding a robust and user friendly fluids modelling tool. The fluid connectors are those found in the Modelica.Fluid library which maximize the possibilities for extending and integrating fluid components that use Modelica.Fluid connectors. Figure 2: Left: Snapshot of the top level of an intake system including the air filter, throttle body, plenum and cylinder head ports. Right: Snapshot of the sonic restrictor within a racing spec MVEM plenum. The Engines library mechanics utilize an efficient multi-body Rotation 3d package for modelling rotating bodies. All shafts, bearings and mechanical engine systems are derived and built from components within this package. We utilize Modelica Standard Library mechanical connectors for multi-body, translational and rotational domains. 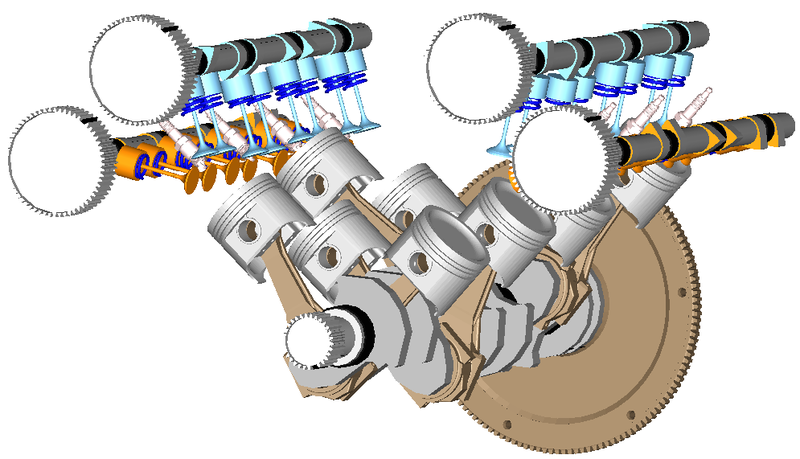 Figure 3: Example of the 3D rotational mechanics visualisation for a V8 engine. Each visualiser is coupled to a body with mass and inertia. 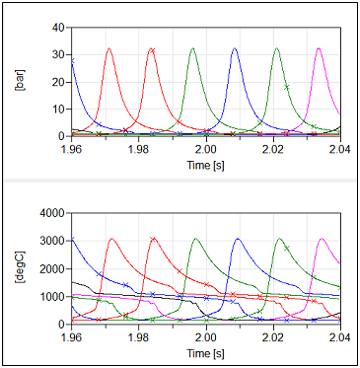 MVEMs will typically be fast to run and require engine steady state test data for parameterisation purposes. They are mainly used for driveability studies and transient response studies given their ability to model the filling and emptying of the intake and exhaust manifold during operation. Controller development and emissions after-treatment studies are further applications to which MVEMs are suited. 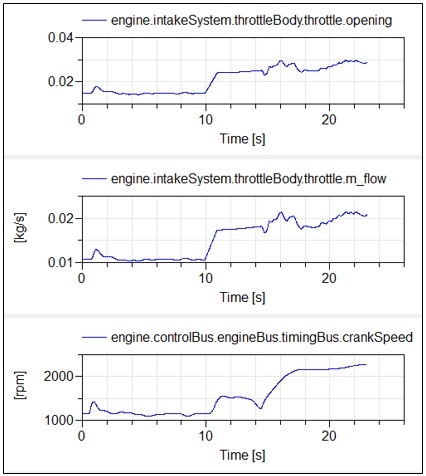 Figure 4: Plots showing typical results from a MVEM experiment where intake system mass flow rate, throttle position and engine speed are calculated for the start of the ECE 15 drive cycle. CAREMs will typically be used when there is an interest in modelling the pulsating air flow within the engine air paths or representing the torque pulsations due to the individual combustion events. It is therefore suited to airpath resonance studies and torsional vibration studies. A new predictive 2-zone combustion model offers improved predictive capabilities over the more empirical Wiebe burn rate estimation. Feel free to contact sales@claytex.com to get more information on the VeSyMA – Engines library.